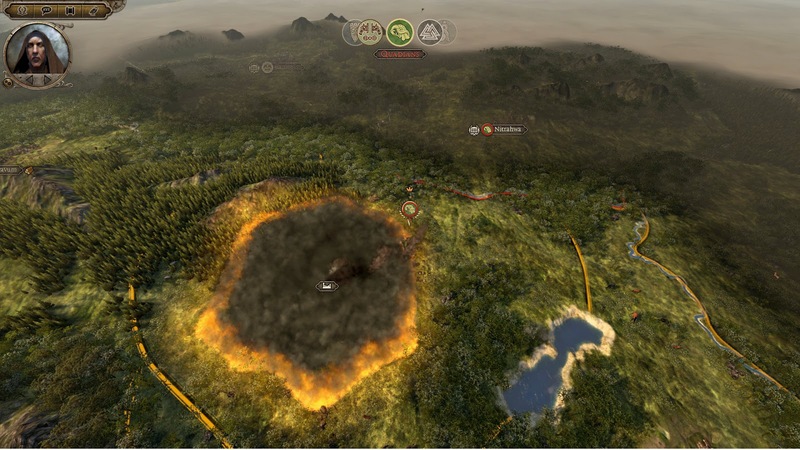 Having been forever scarred by the experience, we continue to recount the first few turns of our Western Roman campaign in Total War: Attila. We pick up immediately after Part 1. The valiant Roman defence of Britannia did little to deter the barbarian hordes on other frontiers. It is worth noting we are still processing the very first turn of the campaign. 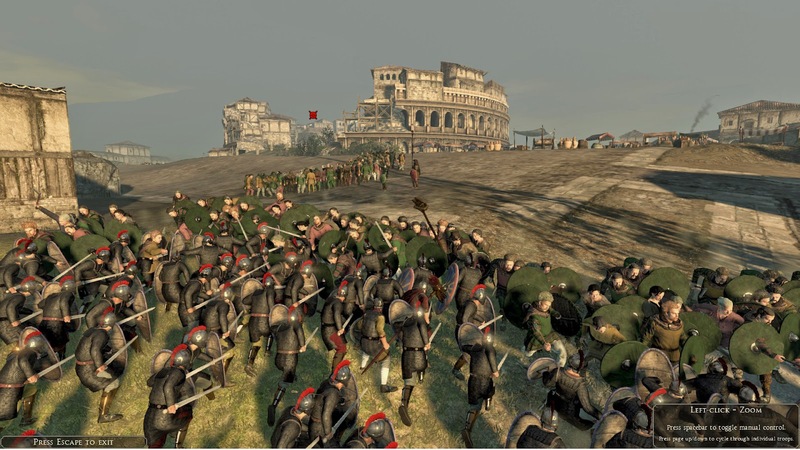 Over in Pannonia, the Quadians launch an attack on the town of Savaria, and I begin to regret reducing the Legions as much as I did. Against such odds, leveraging the terrain and natural choke-points of the town isn’t just advisable, its downright essential. The siege begins well, with the majority of the Quadians forces assaulting the defensively postured Limitanei Borderguards in the center of town. As a band of Quadian spearmen break off to assault one of our few watchtowers, I move my Equites in for an attack. 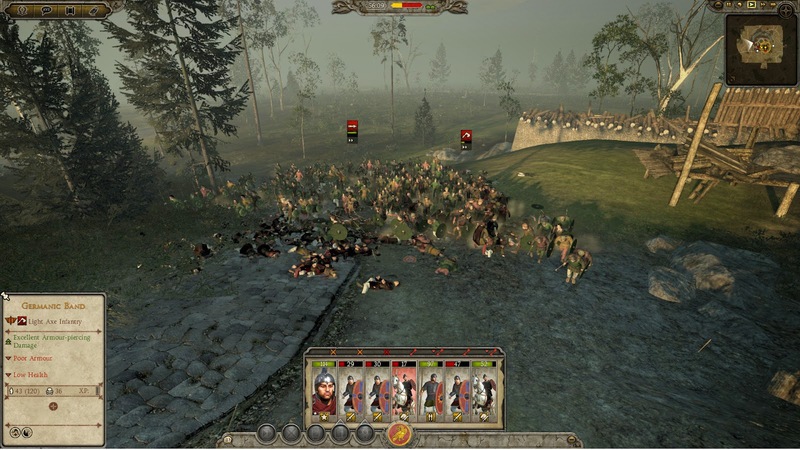 There is considerable risk, in sending cavalry to attack spearmen, but the shock of an attack from the rear, combined the ensuing bloody melee should be enough to send them running. Moments later I noticed that their general will soon be exposed, clearly not wishing to squander such an opportunity, I order my own general and his formidable Palatina Guard to exploit gap in enemy formation. 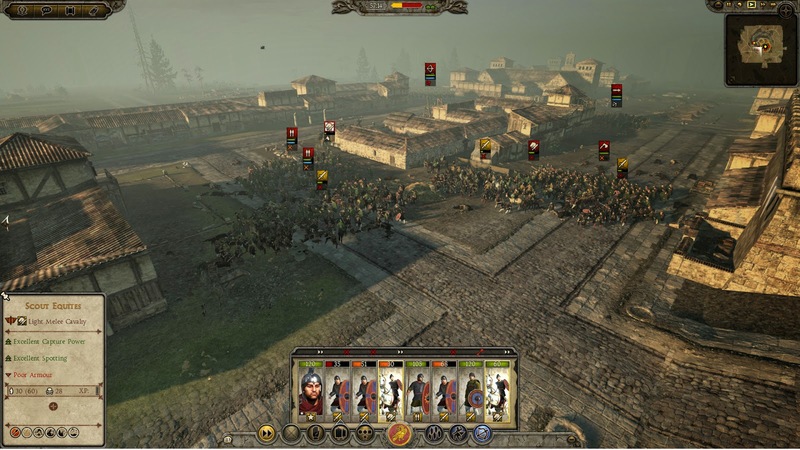 I also move the Explorates out of their defensive position on the right, into an attack on the enemies flank. My hope is that the pressure of the counterattacks on the outer elements of their formation and their general, will be enough to send the Quadians into a full retreat. Ideally, before my Cohors in the center are overwhelmed. The situation in the town center looks untenable. Alas, the Explorates are outmatched by the Quadian axemen on the right, and the centre begins to crumble. I recall my Equites in an attempt to break the Quadians in the center, but the attack serves only to reduce my cavalry to fleeing tatters. It is all up to my general to make of the difference. 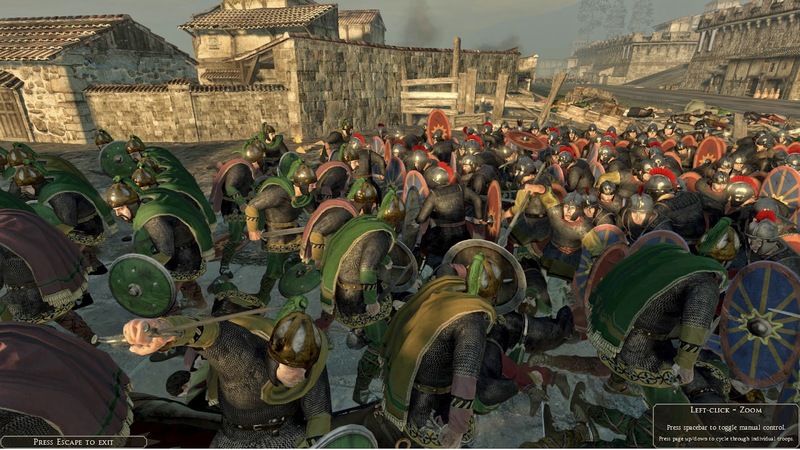 The Palatina Guard make one final push. 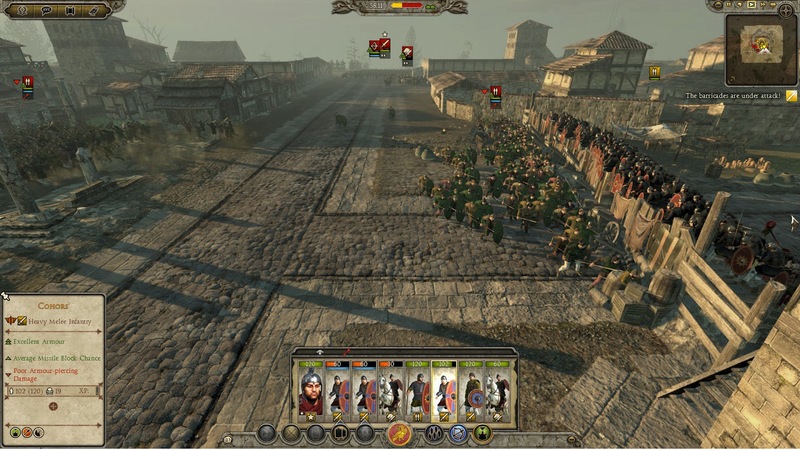 Unsurprisingly, the Quadians seize the town and my general is cut down, rather unceremoniously in the street. Savaria is razed to the ground in a rather fabulous display of pyrotechnics, and the Empire is left wide open to the hordes that will doubtless descend from the steppes. 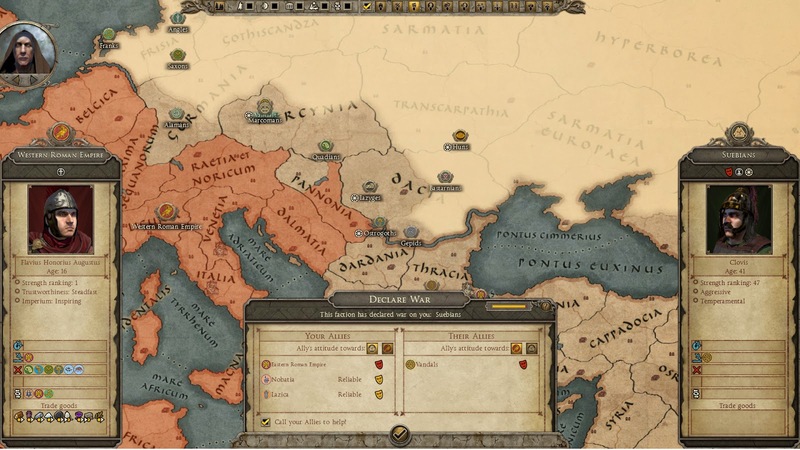 As if to merely salt the already stinging wound of our defeat, the Suebian horde near Lugdunum declares war on Rome, and the Eastern portion of the Empire refuses to answer my call for aid.